Things are just getting worse for a Dodgers team that is now 16-23. And yes, that's Cody Bellinger bunting on a 3-0 count down two runs in the ninth. The Los Angeles Dodgers won an MLB-best 104 games last season and went to Game 7 of the World Series. They’ve won five consecutive NL West titles. Even after losing star third baseman Justin Turner to a broken wrist in late March, they were still projected by FanGraphs to win around 95 games this season and comfortably win the NL West. It feels like it should be crazy to be very worried *in May* about a team we know has been awesome for many years and was expected to be one of the best teams in baseball again this season. 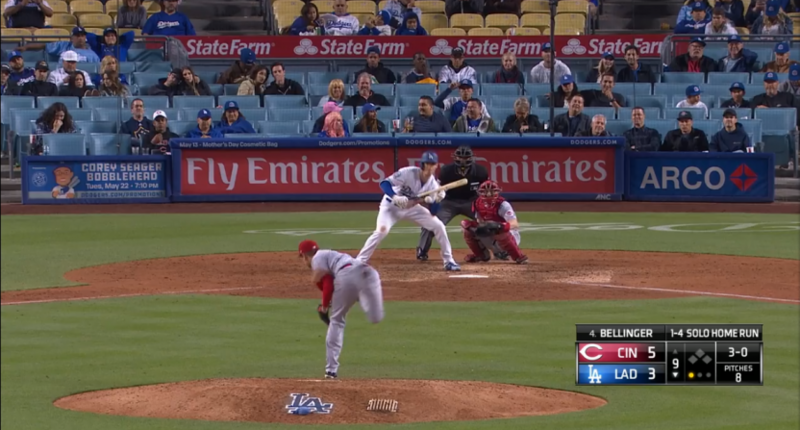 The Dodgers lost 5-3 at home to the Cincinnati Reds on Saturday night, to fall to 16-23 on the season. They’ve lost the first three games of the series to the Reds, a team that entered the series 10-27. Saturday night’s loss included star first baseman Cody Bellinger inexplicably bunting on a 3-0 count — odds are he was going to reach base anyway — in the ninth inning when trailing by two runs, despite manager Dave Roberts claiming he gave Bellinger the take sign (this isn’t the first time lately that Roberts and Bellinger have had their drama). Dave Roberts on why Bellinger bunted 3 and 0: “I don’t know.” Said Bellinger has the take sign. Only three teams are worse than the Dodgers in the NL so far this year: the Reds, Marlins, and Padres. Los Angeles has already lost series to all three teams, and are one loss away from suffering a four-game sweep at home to the Reds. They’re not just losing games; they’re losing games to the worst teams. The Dodgers are in fourth place in the NL West, eight games behind what appears to be a truly good Arizona Diamondbacks team (NL-best 24-15 record; won 93 games last season). Even if the Dodgers were to eventually turn things around and play the baseball they’re capable of, an eight-game deficit is a lot of ground to make up on a good team (and they’ve already played 12 of their 19 head-to-head games with Arizona). That’s especially the case when you consider the very real, concerning issues the Dodgers have right now (putting aside the crappy record, and crappy play vs crappy teams). The main thing of course is on the injury front, something that isn’t the Dodgers’ fault. It’s really been an extremely unlucky few months health wise. I already mentioned the Justin Turner wrist injury; he should return soon, but we don’t know if he’ll be the same elite hitter because wrist injuries have been known to sap power. The biggest blow was recently losing shortstop Corey Seager and his likely 6-to-7 WAR production for the year to Tommy John Surgery. Clayton Kershaw is also on the disabled list with a biceps injury and it’s still unclear how long he’ll be out. There are injuries up and down their roster, and key starting pitchers Rich Hill (just came off the DL) and Alex Wood have a rough health history, so it’s hard to confidently count on them to be the starters the Dodgers probably need them to be. 23-year-old right-hander Walker Buehler is quite impressive, but he’s also likely to be on an innings limit in his rookie campaign. And then you factor in the concerning performance of some other players the Dodgers need to be good. Kenley Jansen’s numbers are way down across the board, and while his velocity is up a tick from the first few weeks of the season, he still doesn’t look like the elite closer he’d been every season since 2012 (they also lost setup man Brandon Morrow to the Cubs in the offseason). 27-year-old utility man Chris Taylor (.236/.306/.424) appears to be regressing after shocking the baseball world with a 4.8 WAR last season. Rich Hill has been really bad (7.11 ERA, 6.47 FIP) in the four games he’s actually pitched, and is 38 years old. This Dodgers team is 2005-level unwatchable right now. With some devastating injuries, key players underperforming, and an eight-game division deficit, it will be really hard for the Dodgers to win the NL West title. We visualize the Dodgers as being among the MLB’s most talented and deep teams, because we’ve seen it year after year, and it’s how the roster appeared entering Spring Training. But it’s very possible that the talent and depth just isn’t going to be there this time around, and it will need to be in order to win the amount of games necessary to top Arizona for the division crown. After the 95-win projection to open the season, FanGraphs now projects the Dodgers to win just 85 games (which honestly sounds like a fair over/under number at the moment). Five Thirty-Eight projects them to win only 83 games. The good news for the Dodgers is that the NL West crown isn’t the only route to the playoffs- two teams will win Wild Card slots. The bad news is that, while the NL is lacking in superteams, the league has plenty of teams that appear capable of competing for a Wild Card slot. Even if we remove the other likely division winners in the Washington Nationals and Chicago Cubs (and D-Backs, obviously), there are still six other NL teams with winning records right now: the St. Louis Cardinals (22-15), Pittsburgh Pirates (23-16), Philadelphia Phillies (22-16), Milwaukee Brewers (23-17), Colorado Rockies (22-18), and New York Mets (19-17). FanGraphs projects all of those teams win at least 80 games, and the Cardinals are the Wild Card favorite at 89 projected wins. Oh, and the Dodgers are already 6.5 games out in the Wild Card race as well, behind all of those teams and the San Francisco Giants (17-19). A 6.5-game deficit, with so many teams to pass up, is fairly significant. Additionally, it’s unlikely President of Baseball Operations Andrew Friedman would be as aggressive at the trade deadline — especially for rentals, like Manny Machado — when you’re only guaranteed a one-game playoff by clinching a Wild Card berth. It’s not quite time to be in full-on panic mode. It’s still early, and odds are the Dodgers soon start playing much better baseball than they have to this point (it would be hard not to!). But to compete for the division, Los Angeles will need to play really good baseball and hope the Diamondbacks fall off a bit. To even get to 85 wins, the Dodgers would need to play .561 baseball the rest of the way (or, what would be a 91-win team over 162 games). And since the Wild Card format was expanded to two teams in each league in 2012, no team has gotten a Wild Card slot with under 85 wins. It does seem possible this year that a team could get an NL Wild Card slot with under 85 wins because, outside of the Cardinals, none of these other Wild Card contenders appear all that good on the surface. But odds are one or two of these teams surprise and get into the mid or upper 80s. The bottom line is the Dodgers can’t afford to let things get any worse. Their screwing around wiggle room is gone, and now they need to start winning games. The Dodgers should view Sunday’s series finale vs the lowly Reds as a must-win, and if they lose for the Cincinnati sweep, you’ll likely come across a lot more articles like this on Monday morning.